If you’re in the market for a crossover, you have a lot of options. While there’s something for everyone in this diverse segment, Toyota has an SUV that does it all. The RAV4 checks all the boxes for a contemporary compact SUV with its high-tech features, spacious interior, state-of-the art safety tools, and capable powertrain. It also offers some of the best fuel efficiency in its class. For 2019, Toyota completely redesigned the RAV4 to make it more versatile than ever before. It comes loaded with infotainment and safety features, a bold new look, and outstanding performance. The XLE adds extra comfort and safety features to the base model’s setup, including HD Radio and low-speed collision warning. The XLE Premium brings another layer of luxury with synthetic leather interior, a power liftgate, and an available Premium Weather Grade package that combats cold with heated front seats and more. As the name implies, the Adventure trim was built for traveling off the beaten path, and comes equipped with off-road features like all-wheel drive and downhill assist control. Rounding out the trims, the Limited opens up the highest-grade options for available infotainment features, plus safety tech like rear cross traffic braking. Whether you need to commute through DeKalb or Sycamore or explore the open roads of Illinois, the redesigned RAV4 will deliver. To really see what makes the new model such a versatile vehicle, you’ll have to try it out for yourself. Come by our dealership and take it for a test drive today! The RAV4’s cabin has never looked better, with updated stylings and soft materials for sustained comfort on long trips. The SUV seats five with a great deal of head clearance and legroom. Car seats can be secured with two full sets of LATCH connections, and the rear seats fold down to open up 69.8 cubic feet of cargo space. With the redesign, drivers will notice a few styling touches inspired by the Tacoma, and the new model sports a broader fascia with LED lights. For the 2019 RAV4, Toyota put a 203-horsepower 4-cylinder under the hood, paired with an eight-speed automatic transmission. It’s capable of smooth cruising in town and on the highway, and it delivers some of the best gas mileage in its highly competitive segment. You’ll always feel in-control with the RAV4’s responsive steering, and the compact takes corners with poise and grace. It can even hold its own if your journey takes you off-road. 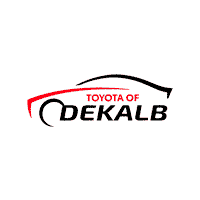 At Toyota of DeKalb, it’s our goal to provide premium customer service when you visit our showroom. You’re sure to find the vehicle you’ve been dreaming of, and our new and pre-owned Toyotas cover a broad range of trims, models, and prices. First, you can check out our inventory online, then come by the dealership to explore our lot. Whether you’re looking for an outstanding compact SUV or any other versatile Toyota, our team will be standing by to answer your questions. While you’re here, we’ll also discuss our financing options to make a great deal even better.